The property’s immaculately maintained bungalows and extensive landscaped grounds are a city landmark. We offer room variety, including sleeping, kitchen and large family units; parking is at your door, and free. Adjacent to restaurants, 15 minutes to downtown Vancouver, on transit routes, near SkyTrain and the province’s largest shopping and entertainment complex, at nearby Metrotown, with 500 outlets, including many well-known retailers. Small pets are welcome. Showers and combination baths, cable TV and complimentary coffee. Over half our units are non-smoking. The front desk is open 24 hours. We look forward to welcoming you to Vancouver, proud host of the 2010 Winter Olympics. 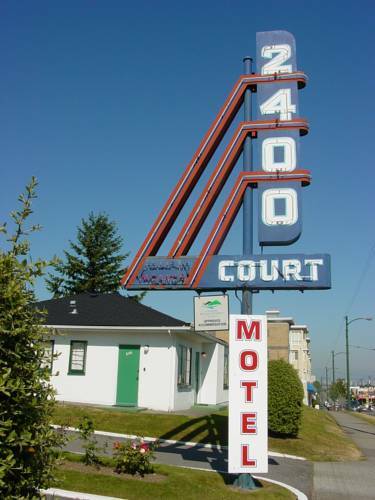 Many of our guests wish to visit the sites, and find the 2400 Motel’s central location convenient, be it for a day trip to Whistler, or the various sites around the City. The 2400 is only a short stroll from a SkyTrain station, providing fast transit to the downtown core, BC Place Stadium and suburban areas. Our kitchen units attract many long-term visitors – we offer favourable rates for extended stays.